Delhi-based Health Arx Technologies Pvt. Ltd, which owns diabetes management app BeatO, has raised Rs 11.75 crore ($1.7 million at current exchange rate) as part of its pre-Series A round from new and existing investors. New investor Orios Venture Partners led the round and existing investors Blume Ventures and Leo Capital joined in. The funds will be utilised to increase user base and revenues besides expanding the product line for flagship glucometer and retail categories. Some portion of the funds will be used for R&D (research and development) and product development. “A diabetic consumer spends more than $1,000 across different aspects of their medical care and lifestyle in a year. This is currently a broken experience with multiple suppliers that don’t talk to each other or to the user on a common platform,” Anup Jain, managing partner at Orios Venture Partners, said. Prior to this, in April 2018, BeatO had raised $1.3 million (Rs 8.45 crore then) in a funding round co-led by Blume and Leo Capital. BeatO was founded in 2015 by Yash Sehgal, Abhishek Kumar and Gautam Chopra. Through a mobile app, the startup offers a comprehensive diabetes management and care platform via its glucose-monitoring solutions. It also offers diabetes-specific products such as snacks, speciality food and footwear, besides a marketplace of doctors, educators, diagnostics, medicines refills and insurance products. 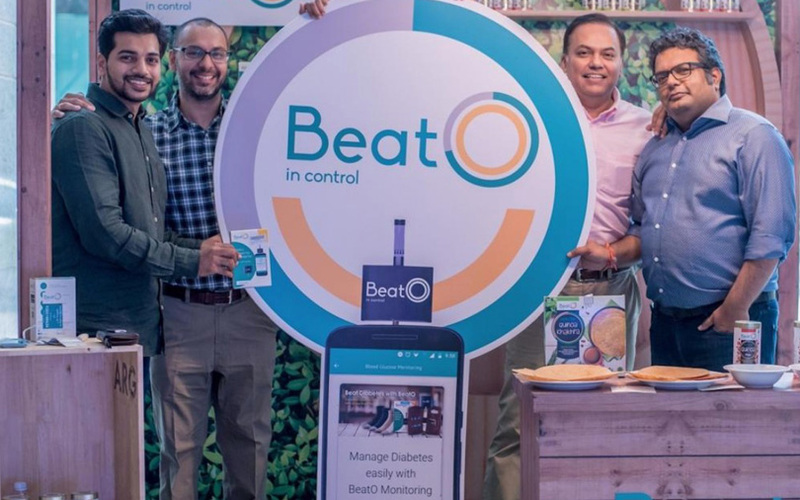 BeatO currently claims to serve around 50,000 diabetics across more than 1,500 cities and is currently fulfilling over 15,000 transactions a month. “...With increase in the disposable income in the Indian middle-class, we foresee an increase in discretionary spends. For a diabetic, we expect this to be channelled into personal management solutions and more consumption of customised food and retail products,” co-founder Chopra stated. Chopra is a management post-graduate from the Indian School of Business (ISB). He had a six-year stint at German airline Lufthansa Group and last served as the head of business development and sales at its subsidiary Brussels Airlines. Prior to that, he had worked at Deloitte Consulting and Tata Teleservices. Sehgal, who is the chief operating officer, is an IIM-Kozhikode alumnus. He previously co-founded health-tech venture S3 Healthtech Pvt. Ltd.
Kumar, chief technology officer, is also an ISB alumnus. He had earlier co-founded two startups— infotech services firm Softdive Technologies Pvt. Ltd and marketing-tech startup Madpiggy Solutions Pvt. Ltd. Earlier, he worked at Biocon and Dr Reddy’s Laboratories. In the mobile app-based diabetes management and care segment, BeatO competes with the likes of Wellthy. Last month, India’s third-largest drugmaker Cipla Ltd announced that it had agreed to acquire a 11.71 % stake in health-tech startup Wellthy Therapeutics Pvt. Ltd for Rs 10.5 crore ($1.5 million then).